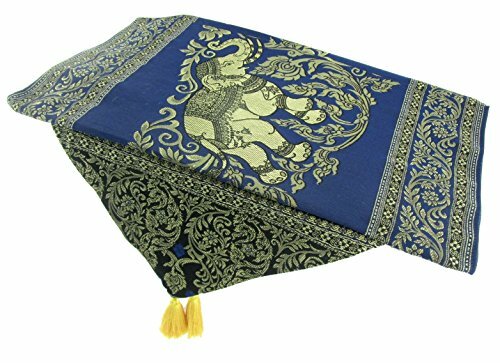 Blue Orchid Thai Table Runner Elephant with Tassels Embroidered Gold Elegant Bed Scarf Large 19'' x 76'' by Blue Orchid at Thai City Deals. MPN: Runner L Blue. Hurry! Limited time offer. Offer valid only while supplies last. Add elegance to your home with a gorgeous embroidered elephant runner. It has a beautiful Thai traditional paisley trim with adorable golden tassels. Add elegance to your home with a gorgeous embroidered elephant runner. It has a beautiful Thai traditional paisley trim with adorable golden tassels. A shiny gold tone design with a motif all around will give a pleasant look on a table, bed, or a wall. It has a dark color tone which helps hide potential stains. The magnificent embroidery pattern in the middle depicts a couple playful lucky royal elephants with raised trunks up surrounded by an ornate floral pattern. This elegant runner is a thick 100% polyester (silk-like) fabric which is light weight and durable. It is perfect as a decorative centerpiece on your dinning or coffee table for any special party includes Thanksgiving, Christmas, Easter and wedding with friends and family. It is excellent as a bed scarf runner for foot of bed that will fit both queen and king size. Creates luxury in a guest room, hotel and spa. Furthermore, it would be appropriate as a bohemian elephant tapestry wall hanging in an office, living room, yoga studio or meditation room. Lastly, It is also a great gift idea for a wedding, birthday, anniversary, housewarming and all occasions. Measurement is approximately 19" wide and 76" long with 3" tassels drop. Care instruction : Machine wash at delicate cycle. Do not bleach Do not tumble dry Iron at low heat Dry clean Hand wash.
USA-based seller. Ships fast from USA. Luxurious Thai traditional runner, elephant and paisley design in shiny gold tone with adorable tassels. Embroidery pattern in the middle depicts a couple playful lucky royal elephants with trunks up.